With the lazy summer months upon us, this Mom believes there is no activity more important to maintain than reading. While my elementary age son is free to choose his own reading material, I am careful to ensure that he has plenty of quality books for children available in his browsing library. I am certain to include educational books for kids on topics that he will find appealing. 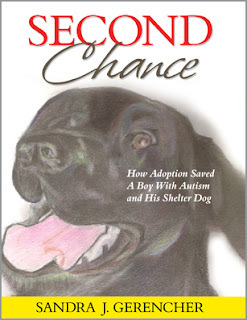 Second Chance is such a book, not only touching a subject near and dear to our family's heart, homeless pets, but also encouraging understanding regarding Autism, which leads to broader perspective, tolerance and kindness. The theme of adoption, both of the two-legged and four-legged "child" variety, provides further opportunity for meaningful follow-up conversations with your young reader. Second Chance is recommended as a PBS non-fiction selection on the topic of adoption. 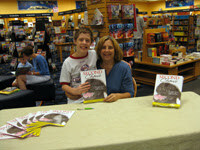 I thoroughly enjoyed exploring Second Chance with my son, as well my teen daughter. Beyond reading the book together, the discussions we had afterward were priceless. Author Sandra J. Gerencher's personal story is simply inspirational. A champion of last chance shelter dogs, her spirit of giving extended to adopting her son, Terry, a child with the genetic disorder, Fragile X Syndrome. In keeping with this sharing, a portion of the proceeds from the sale of this book are donated to the Humane Society. Spark the spirit in your family and support homeless pets via the Humane Society by purchasing your own copy of Second Chance from Tribute Books. Tribute Books and author Sandra J. Gerencher are generously offering That's What She Said readers an opportunity to win a copy of Second Chance! To be eligible to enter this giveaway, you must follow That's What She Said publicly via Google Friend Connect (mid right sidebar). This giveaway is open to residents of the US & Canada, ages 18+ and will end on Saturday, July 16th, 2011 at midnight, EST. The winner will be randomly selected from all eligible entries and notified by email. The winner will have 72 hours to respond before I must move on to a runner up. Please leave your email address, in anti spam format, in your first entry if it is not available via your comment name, so I may contact you if you are the winner. For mandatory entry, please visit the Second Chance website and then tell me in a comment here something you learned there or something you appreciate about this book. * Like That's What She Said or Tribute Books on Facebook, leave comment here with your Facebook name, 2 entries each. * Visit the website of your local chapter of the Humane Society or the Humane Society Facebook Page and tell me in a comment what activities are currently going in which one might volunteer, 3 entries. * Enter any of my other active giveaways and leave comment here, letting me know which, 2 entries per additional giveaway. * Follow Tribute Books or That's What She Said (tsue1136) on Twitter, leave comment here with Twitter name, 1 entry for each. Tweet it up to 3 x per day for an extra entry. * Share this giveaway in some other fashion - Stumble, Digg, Technorati, Blog it, post to Facebook, post on giveaway linky. Handy Share button at bottom of post. Please be certain to include a direct link back to this giveaway in your sharing. 5 entries for each method of sharing, leave a link to your sharing in your comment. * Take an extra entry for subscribing via email or RSS feed to either or both That's What She Said or Tribute Books (mid right sidebar on each site) Leave comment with applicable name, 1 entry per action. Congrats to Laurie, comment #17, courtesy of Random.org! On behalf of Sandra J. Gerencher, Tribute Books and That's What She Said, thank you to all entrants for participating and following! I was provided with a copy of Second Chance to explore for the purposes of creating this feature. The opinions above are both honest and my own. Images and information sourced from various Tribute Books and Second Chance sites. Giveaway prize is provided by and shipped by sponsor. Facebook is not responsible for nor is in anyway involved in this giveaway. Terri - thanks for hosting the giveaway of a copy of "Second Chance" and for recommending the book as quality reading material for children. We appreciate your support and good luck to all who enter. I am a follower and would like to read this uplifting work! 2. Sandy sounds like a loving caring parent.